Animation of the growth of the crack in the Larsen C ice shelf, from 2006 to 2017, as recorded by NASA/USGS Landsat satellites. Credit: NASA/USGS Landsat. Download additional imagery from NASA Goddard's Scientific Visualization Studio. Larsen C, a floating platform of glacial ice on the east side of the Antarctic Peninsula, is the fourth largest ice shelf ringing Earth’s southernmost continent. 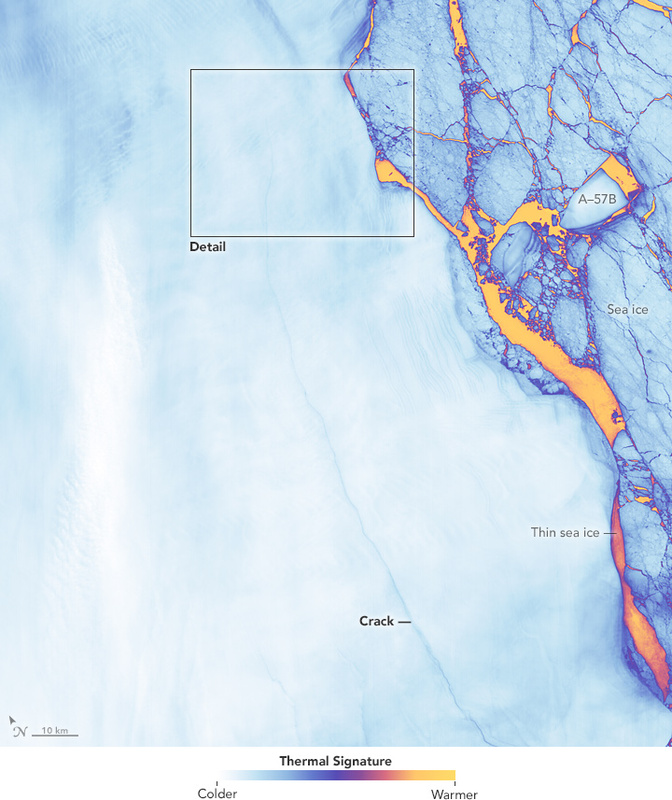 In 2014, a crack that had been slowly growing into the ice shelf for decades suddenly started to spread northwards, creating the nascent iceberg. Now that the close to 2240 square-mile (5800 square kilometers) chunk of ice has broken away, the Larsen C shelf area has shrunk by approximately 10 percent. Thermal wavelength image of a large iceberg, which has calved off the Larsen C ice shelf. Darker colors are colder, and brighter colors are warmer, so the rift between the iceberg and the ice shelf appears as a thin line of slightly warmer area. Image from July 12, 2017, from the MODIS instrument on NASA's Aqua satellite. Credit: NASA Worldview. Download additional imagery from NASA Goddard's Scientific Visualization Studio. Scientists have monitored the progression of the rift throughout the last year was using data from the European Space Agency Sentinel-1 satellites and thermal imagery from NASA's Landsat 8 spacecraft. Over the next months and years, researchers will monitor the response of Larsen C, and the glaciers that flow into it, through the use of satellite imagery, airborne surveys, automated geophysical instruments, and associated field work. Throughout the sunlit months of late 2016 and early 2017, scientists watched closely as a crack grew across the Larsen C ice shelf on the Antarctic Peninsula. On June 17, 2017, the Thermal Infrared Sensor (TIRS) on Landsat 8 captured a false-color image of the crack and the surrounding ice shelf. It shows the relative warmth or coolness of the landscape. Orange depicts where the surface is the warmest, most notably the areas of open ocean and of water topped by thin sea ice. Light blues and whites are the coldest areas, spanning most of the ice shelf and some areas of sea ice. Dark blue and purple areas are in the mid-range. Credit: NASA's Earth Observatory. Read more. The blue hue of the crack indicates that relatively warm ocean water is not far below the ice surface. 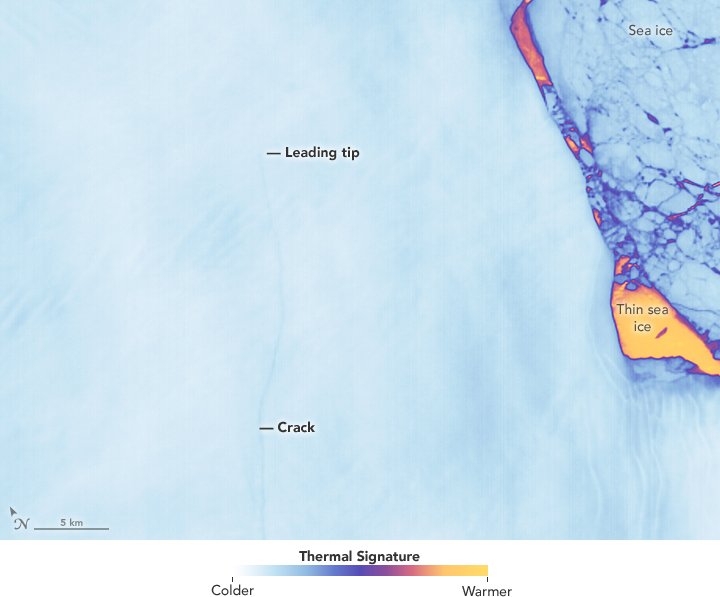 No part of the crack appears as warm as ocean areas, likely because there is a soup of floating, broken ice pieces from the rift’s walls and bits of sea ice sitting atop the water-filled crack. (This mixture can act as a weak glue, but it also prevents the rift from healing.) Credit: NASA's Earth Observatory. Read more. “It’s very unlikely it will cause any trouble for navigation,” Brunt said.